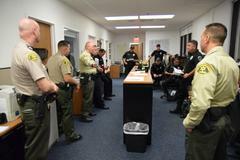 The Los Angeles County Sheriff’s Department Metrolink Bureau, partnered with the Fontana Police Department, the Burlington Northern Santa Fe Police Department, and the Union Pacific Police Department, to enforce traffic laws at rail grade crossings in the City of Fontana, California, on Wednesday, September 7, 2016, from 6:30 to 9:15 AM. The goal of the grade crossing enforcement operation was to bring awareness through education and enforcement. Each of the departments fanned out around the city to monitor rail crossings during the enforcement period. Approximately 1600 vehicles and pedestrians crossed the railroad tracks during this period. 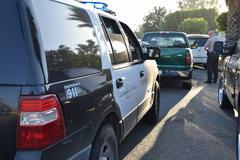 23 citations were issued for vehicular grade crossing and other vehicle code violations. No arrests were made nor pedestrians cited. The National Transportation Safety Board (NTSB) has shown that railroad deaths have increased year over year, and the vast majority of fatalities are trespassers, including those struck by trains at rail grade crossings. Rail grade crossing accidents involving Metrolink trains, like those in Burbank, Oxnard, and just recently in Sun Valley, remind us of how just one vehicle making contact with a train travelling at an average speed of over 60 miles per hour, can cost the lives of motorists and train passengers alike. Enforcement operations like this one have been shown to reduce the number of safety incidents involving vehicles and pedestrians. 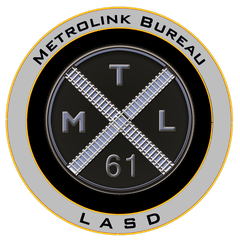 Although Metrolink Bureau units routinely patrol rail grade crossings when not answering calls for service, the Sheriff’s Metrolink Bureau will partner with several law enforcement agencies throughout Rail Safety Month for targeted enforcement at certain crossings along the rail system.